The average tip amount across all platforms is has fallen to ~$0.91, while the average tip amount on reddit is only ~$0.37… we can do better! Take moderation positions in communities where your profession, employment, or biases could pose a direct conflict of interest to the neutral and user driven nature of reddit. Like many of you, I first heard about bitcoin years ago, but didn't get involved due to difficulty procuring any actual bitcoin. As time went on, bitcoin kept popping onto my radar. The April '13 bubble, the Silk Road bust, the guy who bought $27 worth of bitcoin in '09, only to forget about it until its value appreciated to $886k, the guy who threw away a hard drive containing $7.5 million worth of bitcoin. And of course, people tipping bitcoin across reddit via /u/bitcointip. This seemed like something I needed to know more about, so I subbed to /r/bitcoin to start reading more. That was September '13, right at the onset of the December '13 bubble. It was also at the height of the Edward Snowden story, so bitcoin overlapped well with my interest in privacy and encryption. It didn't take long for me to be consumed by the technology's potential. I began making Moronic Monday threads every week for the past year. Huge thanks to all the askers and answerers! As I've said in the past, the most rewarding thing about answering questions about bitcoin is to see people reach a point where they can start answering questions too. Back then, I had been experimenting with /u/bitcointip and was left wanting more. Enter /u/changetip. I signed up about a year ago and was quite impressed, even though it was still pretty rough around the edges. I made countless feature requests and bug reports to help improve the service, and was invited to help moderate the /r/changetip sub soon after. A couple months later, I applied to help moderate /r/bitcoin. With a good deal of patience and guidance from other mods, I've grown to be rather effective over the past year. Overall I would say that helping to moderate /r/bitcoin has been very rewarding. My goal from the beginning has been to try and raise the level of civil discourse around here, and while success is certainly debatable, I like to think I've made a positive impact. It's been stressful at times, but I've made some good friends and had countless discussions with some really brilliant people which has made it a worthwhile experience. I was passing through San Francisco back in January and took the opportunity to spend the day with the ChangeTip team. We really clicked and I made several new friends. They struck me as being very knowledgeable, determined, and extremely passionate about driving bitcoin adoption. We talked at length about the difficulties that new users have with getting their first bitcoin, and what changetip can do to help. I was recently approached by ChangeTip with an offer to formalize our relationship. The team has been working very hard since I've known them and have experienced substantial growth. This has resulted in their support channels being a little overwhelmed at times, and they're looking for a few people who are familiar with the service to help write documentation and assist with support issues. This includes consolidating user feedback to help make a better service for their users. Shortly after receiving the offer, I opened a discussion with my fellow mods to determine whether or not they felt my acceptance of the position would be an insurmountable conflict of interest with my mod duties. The mods were supportive of the news and assured me that several mods review logs to watch what other mods are doing, and they will inform me if they feel that I'm acting in a biased manner. I always strive to maintain objectivity, so this point is important for me. In the past, I have asked other mods to moderate threads where I felt that I was too closely involved to make proper judgements, so I believe my ability to remain objective speaks for itself. Therefore, I'm confident that my impartiality will remain largely unaffected by taking on a role with ChangeTip. We finalized our arrangement last week. My highest priority upon accepting this position has been to write this announcement to notify everyone of my new role. That includes putting together a few tipping stats to share with you because we've all been very eager to see how things have been going. Other priorities include getting up to speed with ChangeTip's support backend, familiarizing myself with tipping on other platforms to better assist users, and helping to write documentation about the service's features. Beyond that, I'm hoping we will implement a forum or chatroom at the main changetip site where users from all the different platforms can come together to help each other out and have a good time. Since January 1st 2014, ChangeTip has attracted ~75,000 users who have connected ~120,000 social accounts. These users have sent ~225,000 tips, of which ~73% were collected. The total cumulative USD value of tips sent is ~$250,000 and ~$190,000 was collected, leaving ~$60,000 in tips refunded to the original sender. The average tip amount across all platforms is has fallen to ~$0.91, while the average tip amount on reddit is only ~$0.37… we can do better! My Excel-fu isn't the greatest, but I've managed to cobble together some charts, hopefully without errors. Please keep in mind that I'm not a data analyst. 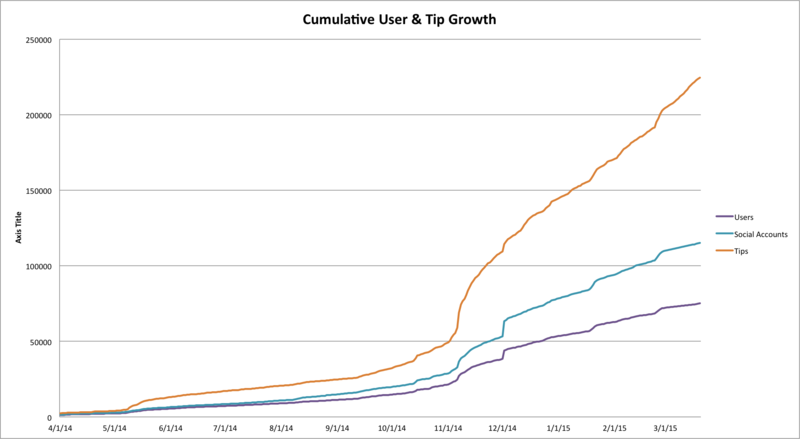 This chart shows the growth in the number of users, social accounts, and tips over the past year. 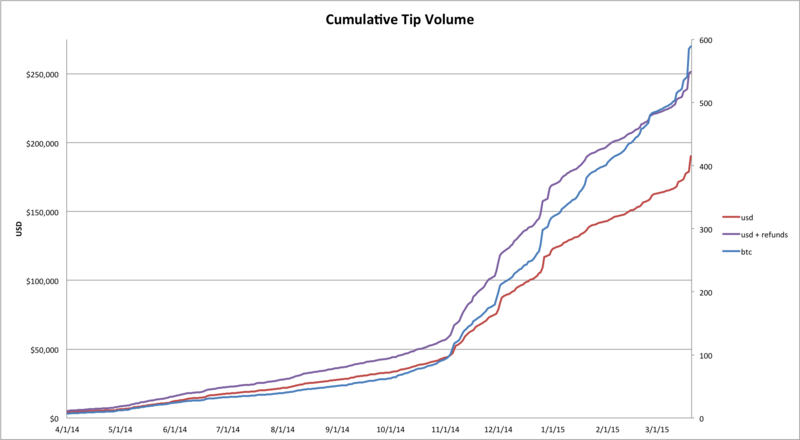 This one shows four different ways of looking at the total tipping volume over the past year. The left axis is for USD and the right axis is for BTC. This last chart is interesting to me, but I'm not sure what we can glean from it. 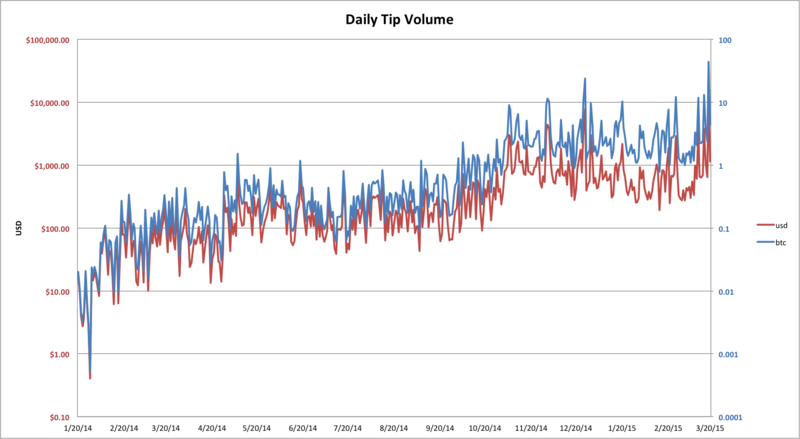 It shows the USD and BTC amounts tipped per day on a log scale. I interpret it as showing that 1) tip volume decreases when the price of bitcoin decreases, and 2) the divergence of the two lines indicates that the btc amount of tips has continued to grow, the usd amount of those tips has decreased due to the sustained bear market. For example, when 1000 bits were tipped one year ago, they were worth $.55, but today that same tip is only worth $.25… Maybe I can visualize this in Excel with some more time, but it's not a high priority right now. I'm very grateful that the folks at ChangeTip have given me this opportunity, and I'm excited to be a part of such a driving force for bitcoin adoption. The platform has proven to be a simple, low-risk way to introduce people to their first bits, which is why I believe the ChangeTip community will continue to raise awareness for bitcoin across social media. Furthermore, I've been seeing the success of /u/changetip when pitted head to head against PayPal over in /r/millionairemakers and it reinforces my belief that ChangeTip has a good chance at becoming a major player in online remittance. TL;DR: I'm now working for ChangeTip part-time. I will continue to help moderate as usual, but will defer most tip-related mod actions to my fellow mods except for the most obvious cases. The only difference you might notice is that I won't be tipping as much, but I will be working very hard to help provide the most enjoyable user experience possible. Moar changetip lulz, kudos to /r/buttcoin , with coming out of an changetip astroturfing slash trolling bot operator. Nice, thanks for sharing that bit of lulz.